It is that time of year again where we need to think about Father's Day gifts. So I have been trolling the net for some cool gift ideas. I found things like cute free Printable books, cool free printable DAD glasses card, awesome Personalised Barclays card, and my post on ideas for photo gifts here. Then I thought I would ask Mr 2littlefaces, after all he has over 3 years experience at being a Dad. Well, all I can say is please keep in mind that this list was made after an intense week at work, half a bottle of wine down, and at midnight. 1. A Lie-In - Who doesn't love a lie in! 2. Nice lunch - Obviously he is planning to lie-in till lunch time. 3. Xbox game - Because he has the time. 4. Time to play Xbox - Oh I see. 5. Midlife crisis car - But I thought you already went through this phase! 6. Ride in a helicopter - He is still determined Miranda. 7. Nice dinner - Take-away then? 8. A Nice bottle of wine - I think you have had enough already, don't you? 9. Clothes shopping - But you have more than I do! 11. New leftfield album - You are really milking this midlife crisis thing aren't you? So there you have it. A first-hand look into what every Dad wants? All I can say is that Mr 2littlefaces will be sadly disappointed this Father's Day! 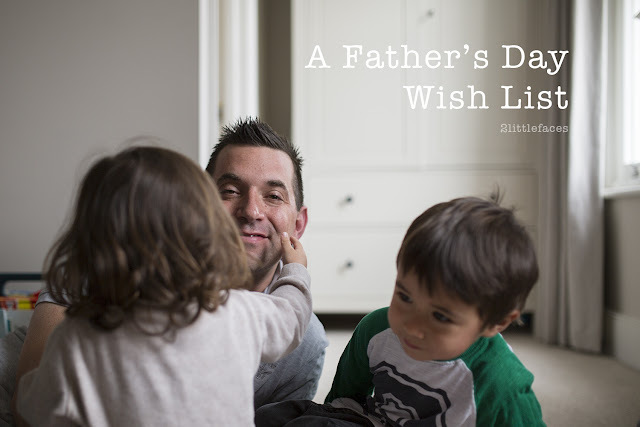 What would your Father's Day Wish List look like if it were left to your Mr?